*NFL Comparison are not a projection of how good they are, more so their style of play. The trade for Alec Ogletree proved to be an effective move for the sheer fact that they finally have a reliable leader in the middle. While he isn’t and won’t be a star, he is a leader of the defense type that brings what you think he will bring each week. BJ Goodson has had issues staying fully healthy but the bruiser impressed late in the year and seems to be a nice fit for the Bettcher scheme. His issues are apparent when it comes to every down duty though and he may be best used in a rotational role. The depth inside is very limited. Summary: Junior entry. Son to Devin Bush Sr who played in the NFL. The 2018 Big 10 Defensive Player of the Year and two-time Butkus Award finalist brings a top tier combination of power and speed to the table that doesn’t come around often. The short, but stout enforcer is the kind of player that can immediately change the personality of a defense. Don’t be fooled by the lack of height when diagnosing his size and presence, as he is big where it matters and is often the most physical player on the field. Bush is a three down linebacker that will have to prove he is healthy and durable, but there is almost no risk with him. He is going to be a stud. *I am still going to label Bush as a top 10 player in this class and while I know he won’t be the pick at #6, he would in the discussion if it were up to me. Sometimes guys with a lack of stereotypical size are mistaken for a lack of physical presence and power, but Bush might be the most physical one of the bunch. NYG has struggled with consistent LB play for a long time and I’ve had many debates whether or not premium picks should be spent on this spot, but I think it is being proven over and over a guy like this can change an entire defense right away. Summary: Junior entry. Two time First Team All SEC defender that has finished at the top of the conference in tackles/tackles per game each of the past 2 years. Was initially recruited and graded as an athlete coming out of high school. Has rare speed and explosion for the thickness he has on his frame. The kind of versatile linebacker that can impact the game in several ways each week. White is a tone-setter that plays the game tough and violent but also has the speed to make things happen up and down the seam and sideline to sideline. There isn’t a role that White will struggle to fill from the linebacker position. He has some areas to improve when it comes to defeating blockers, but he is a sure-thing to be an impact player. *While I am not sold on him being an elite player like some, I do think White is a week 1 starter that can add the physical brand to a defense that many teams are looking for. His standout traits revolve around burst and pursuit speed. He is such a hungry player and excels in reaction-based assignments. I think he can be better off on the weak side, not so much at MIKE linebacker. He isn’t the most instinctive guy and there are a few whispers about intelligence/knowledge of the game. No matter what, he can be a game wrecker. Summary: Fifth year senior with three years of starting experience. Two time Honorable Mention All Pac 12 defender. Okereke fits the mold for today’s ideal linebacker when it comes to skill set. He is more than athletic enough to factor in coverage with his plus-top end speed and easy fluidity in his hips. The length is another plus there and he can really make his presence known physically. He is a tough, hard nosed linebacker that will let you know he hit you. Okereke lacks some of the vital instincts and natural flow and he may struggle with how fast things transpire in the NFL. However he is a solid weak side candidate that can make plays in space and give a defense options. Likely an eventual solid starter. *Last year I had Darius Leonard as a top 5 overall player in the draft, he ended up being taken in the 2nd round and won the NFL Defensive Rookie of the Year award. I bring that up because I have Leonard comps in multiple places for Okereke. I don’t see the same caliber but when it comes to skill set, they are similar. The elite, rare length paired with fluid hips can make him a major weapon in coverage and he is a violent player in traffic. There is a lot he can do, and he will be a true 3 down player. Summary: Two year starter. The former high school star took time to translate to the college level, but the 2018 First Team All American led the nation with 176 tackles, with the next highest being 158. He is more than just a tackle machine, as he forced 6 fumbles, intercepted 3 passes and broke up 11 more in his last two seasons. Plain and simple, this kid is a baller that finds ways to produce no matter the situation or opponent. He has tremendous speed, quickness, and instincts. While the size might be a slight turn off, Burr-Kirven is a sure bet to be at least a productive weak side linebacker that will play assignment football at a high level on all three downs. Never a star, but likely a solid contributor. *It’s hard to watch this kid and not walk away being impressed. The size issue gets a tad overrated especially for the amount of plays he makes in traffic. He knows how to use it to his advantage and there are things he can do that bigger guys simply cannot. I want linebackers that play instinctive and smart in addition being able to cover. If I have to give some stoutness away, that’s fine. Summary: Fifth year senior and four year starter that was All Mountain West three seasons in a row. 2018 didn’t go as many hoped, as he was suspended for a game stemming from an offseason arrest before missing the final month with a shoulder injury that is still hampering him right now. That medical is going to be important for him. Tavai is an attractive linebacker because of his ever-present instincts and aggression. You won’t find a player that gives more hustle and grit that Tavai. That said, he needs to show more a ability against blockers coming at him. He gets a little lethargic at times and doesn’t have the explosion or pop to make up for it. I do like the style and I do think there is 3 down potential here as long as the shoulder checks out. *Tavai was one of my names to watch coming in to 2018, but the game 1 suspension and shoulder injury knocked him down a tad. But the tape, especially from 2017, doesn’t lie. This kid is all over the place but it is more than high-effort. He has legit talent the ability to forecast plays. Really violent player that brings intensity to the players around him. I have some discipline questions here, but I got some feedback regarding his team interviews and meetings and they were all positive. Summary: Fifth year senior and two-time team captain. The former safety suffered torn ACL injuries in both 2014 and 2015, but has bounced back 38 games over 3 years. Tranquill is a blue-collar player that has a couple limitations physically, but seems to always find a way to get the job done on all three downs. He is as smart and quick to react as you will find. Combine that with the violence and aggression he plays with and Tranquill looks like an eventual starter on the weak side and special teams star. The medicals will be important for him. *One of the more underrated players in the class. I’ll tell you what, if the medicals were completely clean here, I would have Tranquill as a first round player. Hard to find someone with the coverage ability, nose for the ball, and toughness like this kid. His athleticism issues are a little overblown and I think he proved that in workouts. I like that you know exactly what you are getting here play by play, week by week. Summary: A former walk on and just a one year starter for the Gophers, Cashman did earn 3rd Team All Big 10 honors as a senior after being on nobody’s radar entering the year. Cashman’s play slowly but surely got noticed more and more as the season progressed. He all-out, all-the-time approach to the game coupled with his speed and violence can make him an asset in most schemes. His weaknesses reside in coverage and he won’t do much to rush the passer, thus his role may be limited at the next level. At worst, he is a core special teamer and solid backup but I see him starting at some point in his career. *While I see a 2 down player here, I think a team looking for a run stuffer in the middle can get a lot out of Cashman. He is a better athlete than advertised based on his reaction time and instincts. Also he is a guy that rarely misses tackles, something I constantly value. Summary: Fifth year senior. Three year starter that spent a season at defensive end before the team moved him to a hybrid edge role. Hollins spent most of his time on the edge but he proved to be a factor in coverage to the point where his versatility grade is what really makes him. Hollins is an every down threat capable of impacting the game in several ways. He plays fast and twitchy, shows developed skill sets across the board, and has a constant sense of hustle. With his frame and athletic ability, there is an upside worth trying to develop. *There is some unknown with Hollins and a lot of what he is being graded on is based on long term projection and development. That said, if he blossoms in to what he can be, he can be one of the top linebackers in this group when all is said and done. He needs to fill the frame out a bit and handle contact with blockers better, but someone with this height, length, speed, and versatility can be a big time weapon. Summary: Four year starter that has overcome a few injuries to his shoulder and knee respectively, but still managed to start 45 games. He began his career off with a bang, winning Pac 12 Freshman of the Year honors before he tore up that knee. He became the leader of that defense real fast and there are almost zero concerns when it comes to his ability to impact the run defense and mental side of things. Smith is a better athlete than some give him credit for, but I still think his primary role will be on early downs. He can hold his own but the impact he can make as a tackler is far greater. Really solid player that can’t do everything, but can do enough. *Bringing in Smith is all about quality depth with the possibility of run defending presence. He won’t be a start but he will be reliable and effective in the right role. Safe player as long as his medicals check out. Summary: Junior entry. Full time for the first time in 2018 but was a steady part of the rotation in 2017 and half of 2016. 2nd Team All SEC to cap his career. If you catch Wilson on the right week, he looks like yet another first round ‘Bama linebacker. However the inconsistencies constantly left me wanting more. Maybe it was just inexperience and maybe had he retuned for his senior season he would have been a sure thing first rounder next year, but I can’t put him much higher than this just because of flashes. I question his ability to forecast and diagnose and I do think a lot of his production came from the talent around him. Still a solid upside pick here with legit talent, but still think he is a ways away. *Man I wish this kid went back to school for his senior season, which I know the coaches were trying to push him towards. Wilson was maddening to watch because he had flashes of big time, just to be followed by the look of a backup just plays later. I won’t deny his upside but I think the talent around him and the fact he is coming from the ‘Bama program inflated his outlook by the general public. I don’t trust him enough. Summary: Fifth year senior. Took a redshirt season in 2016 after being a part time contributor over his first two years. The former defensive end made the full time move to linebacker in 2018 despite being the team’s defensive player of the year in 2017. He took 20 pounds off his frame and slowly but surely earned his way up draft boards with quality, consistent play. Takitaki needs some extra screening, as he was a troublemaker early in his career and was nearly kicked out of the program. He got married a couple years ago and since then, he has been a new person. A very focused and driven player on and off the field, Takitaki has the look of someone drafted day 3 but ends up starting in his rookie year. *Interesting player here. I’ve been told a few teams are looking at him as a day 2 pick. I don’t trust him in coverage but I think he has enough versatility to stay on the field all three downs. He has a knack for winning one on one battles against blockers and I think his experience as an edge guy can only help. He is what I would call a calculated shot in the dark. I predict NE to draft him day 3 and he ends up being a stud, he has that kind of look to him. *Fifth year senior. Former safety that redshirted in 2016 because of a shoulder injury and came back as a linebacker, blossoming in to a 1st Team All ACC defender in 2018, his lone season as the starter. Pratt brings a lot to the table. He is an excellent, physical, wrap up tackler with natural ability in coverage and some pass rush traits that many overlook. On the other hand, he mightily struggles taking on blocks and gets lost in traffic too often. Drafting Pratt is all about the future because he has a ways to go when it comes to learning the game and overall techniques. It wouldn’t surprise me to see him starting in 2 years for a good defense. *Pratt was a favorite of mine initially. He doesn’t miss tackles, I like the 3 down versatility, and he has a very all-business type approach to the game. Bu t after scouting 8 games, the ever-present issues he has against blockers and overlooking assignment football is maddening enough to wait until day 3. For the record, I believe he goes earlier than this. Summary: A one year starter. A career that began at South Dakota in which he was in the running for the FCS Freshman of the year, Van Ginkel bounced around a bit because of a coaching change. With a pit stop at Iowa Western, he ended at Wisconsin and contributed for two years. The 2018 starter led the team with 5.5 sacks in 2018 and totaled 12 over his two years with the team. His pure athletic ability and passionate style of play can somewhat make up for some hesitations and lack of true power. The pass rush upside will largely depend on development and whoever drafts him will need to be patient, but he can be an impactful special teamer. *Upside player here that has the tools and occasional flashes of impact off the edge. Van Ginkel still needs time to mold his game and strengthen his frame, but there is a lot of natural in him. He wasn’t on my radar until late in the year but he showed enough and there is more untapped upside to him than others. Summary: Junior entry. Two year starter that plays the hot/cold style as much as any player in the class. While his effort and hustle are both always on, Joseph really struggles with the skill-based aspects of the game. He makes incorrect reads and poor decisions, one of the reasons the Florida coaches permanently moved him to the weak side. When it comes to speed, explosion, and pop, Joseph has standout ability. He can wreck havoc in the backfield with a violent finisher type style. That athletic ability translates well to the passing game as well, whether he drops back or blitzes. Joseph is an all or nothing player right now but if the right coach gets his hands on him, look out. *Similar to Mack Wilson above, I really wish this kid went back for his senior year. There is 1st round potential in him but the inconsistencies were too frequent for my liking. When he is in full blown attack mode, Joseph is a fun player to watch they can take over a game. He has that kind of talent. If he can sit for a year or two with an attachment to getting better mentally, someone will get a bargain. Summary: Fourth year junior entry. One of the most productive edge rushers in FBS since 2017 will need to make the move to off-all linebacker at the next level. Two time All American and two time Ted Hendricks Award finalist. The lack of size and power showed up on tape during the season and really showed up at the Senior Bowl. Smith has the body and athletic ability to factor as a strong side linebacker that can be used in specific pass rush packages as a blitzer. The stutter step quickness and knack for finding windows to sneak through can be used by the right scheme. *Smith’s production is as good as anyone in the class but I think that was derived from a lack of competition and scheme more so than sheer talent. Nonetheless, he will be a solid backup and very good special teamer. While he was embarrassed the Senior Bowl as a pass rusher, I still think there are things you can do with him. *Fifth year senior that played 4 years at Illinois before grad-transferring to Maryland. He ranked 5th in the Big 10 in tackles and I have several game notes on him saying he has “it”. The inherent ability to locate the ball, beat blockers to spots, an finish off the ball carrier. He doesn’t jump off the screen when it comes to triangle numbers but he proved plus-burst and quickness at his pro day. He will be a core special teamer and has the look of an UDFA that ends up starting somewhere down the road. 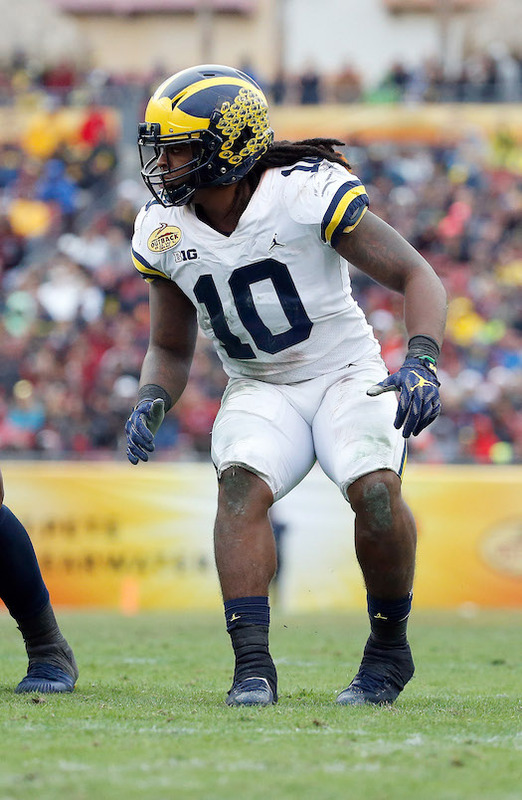 NYG would be smart to take a hard look at Devin Bush and Devin White in the first round. These two are every down players that can impact the running and passing games right away at a high level. I have never bought in to the concept that this position is not valuable enough for high picks. Too often has this defense been burned by poor second level play. The day 2 options aren’t as deep but no matter what, this group needs to be addressed at some point. Linebacker impact can be based on scheme, so the fit will be there at some point. David Syvertsen, aka Sy'56, has worked for Ourlads Scouting LLC since 2013, starting off as a college depth chart manager and now a lead scout for one the most-sold NFL draft guides year-in, year-out. He has been scouting for over 10 years and will compile anywhere from 400-600 scouting reports per season, with that number increasing year by year. He watches and studies game films 20-25 hours per week throughout the entire year with his main focus being NFL Draft prospects.